In one sense I need to be more careful. In another it proves that I am doing the research as I go along. I wrote that our goalkeeper Hugh Lachlan McDonald was the only player to be signed by Arsenal three times. And that’s what I thought when I wrote it a week or two back. But turning what there is of my mind to Arsenal’s players who were signed up for the 1910/1911 season (which if my calculations serve me correctly, was 100 years ago, I find myself considering the inside forward Thomas Tindal Fitchie (11 December 1881 – 17 October 1947). He had the nickname “Prince of Dribblers”, which makes him a very early Stanley Matthews, and he was a businessman who played football in between the business activities. Fitchie came to Woolwich Arsenal in November 1901, played three games and scored three goals. He went a wandering, and came back in 1903 for an away game at Lincoln, and then was away again until he played away against Notts County in December 1904 when with Arsenal in the first division, he scored a hat trick – quite a return. In his run he scored six in nine games, before he was off again. He then managed to curtail his business operations long enough to play for Scotland again Wales in March 1905 – the first of four caps (he scored once). In 1905/6 he scored nine goals in 22 games in the league and two goals in five FA Cup games (he played in the semi final against Newcastle) and was top scorer. But still they couldn’t hold him at the club, and his wandering continued. He didn’t play in the next two seasons, but played 21 times in 1908/9 and scored 9 times. In all, he played 63 times for Arsenal and scored 30 goals. But this was a remarkable man – not content with all he had done so far he joined The Pilgrims, a British side that toured the USA in 1909 as a freelance club demonstrating the game. By 1909, football in the United States was flourishing, with four leagues in the New York/New Jersey area were active, plus two state cup competitions. A similar story of developing interest was to be found across the US from New England to the south west. Slowly semi-professionalism was being introduced. The Eastern Soccer League was founded in 1910 and it seemed that football would soon play a major part in American sporting life. As for the Prince of Dribblers he concluded his career in 1912. So what was he up to? What was his business? What on earth was he playing at? The first thing we have to recognise is that Thomas Tindal Fitchie was an amateur player – although he was undoubtedly paid for his trip to the US (where he probably set up some new business venture). Other than that, we don’t know. But out there somewhere are his descendants and it would be great to find out more. 8 comments to The only player signed five times by Arsenal! Wow! This guy must be really interesting. I’ve heard players coming back to their former clubs in their careers after tryin many different clubs but this guy is unbelievable. There are 3 other clubs that signed him more than once! One thing is for sure, he definaletly lacked club loyalty. This guy must be a great guy and a business man too. TT Fitchie was my granddad and I have carried out a fair amount of research into his playing days. I still have his international caps, his jersey badges (the international kit was owned by Lord Roseberry in those days so no swoping shirts!!). Sadly his four medals were stolen from my Dad. I have original Glasgow newspaper reports for pretty much all of his games for Queens Park and the four internationals. As a young boy, I heard a great deal about his time as an amateur when professionalism was beginning in earnest. This fuelled my love of football. TT was a travelling salesman with Jacques & Co a sports goods and games manufacturer. They encouraged his football career as it allowed them access to the clubs and the players who were his team mates – a bit like sponsorship, I suppose. As an amateur, he was not permitted to be paid. if he scored, he would often find a guinea in his boots after showering. In 1909, his great friend Vivian Woodward(Spurs and England and also an amateur, asked him to go on the Pilgrims tour to the Satets. They sailed on the Cunard Line – SS Mauritania – and I have his US immigration note from the Ellis Island landing in New York in autumn 1909. There was a lot of media interest since this was in fact the second Pilgrim’s tour and senior FA reps were also with the team. The Pilgrims handed out some heavy thrashings but also occasionally met their match because some of the teams were Scots and Irish imigrants (miners )who knew how to play. TT broke his ankle badly mid-tour and in those days it was touch and go if he would play again. He did, as you say in your ace summary of his career. In 1912 he got married – so that probably stopped the wanderings!! He served in France with the Argyll & Sutherland Highlanders in the Great War and, like many soldiers, contracted a lung disorder from which he eventually died in 1947. During the first season he was capped for Scotland he was playing for Queens Park against Hearts at Tynecastle. Against him was Charlie Thompson, centre half, an established internationalist. They were good pals but Charlie had joked that TT should not be playing inside left because he was not naturally left footed. TT proceeded to nutmeg big Charlie twice in a row in front of the home crowd. Incidentally the Arsenal 08/09 team photo season has TT as an insert – so clearly he was hard to track down!! I just wish I had met him. Andrew Fitchie: “hope this is of interest”????? This is wonderful. Thank you thank you for writing. 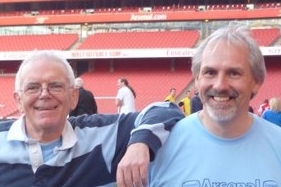 I am having a meeting with the publishers of Arsenal Til I Die later this week at the launch of that publication (I wrote a little bit of it) and I am hoping to take matters forward a little on the publication of a new book about the early days. Once that is resolve I will be back to you, to talk about publishing the information you have in book form. Andrew, this is like crack cocaine to the likes of me and Tony! One further thing that might be useful. I have a picture of Tom Fitchie scoring against Preston NE at Plumstead on 26/09/08. The caption is pretty straightforward ” Fitchie scores” and TT has a big smile on his face. Just possible the reason was that the PNE keeper was Peter McBride, the Scotland keeper that year, and by all accounts a nutter of the first order.